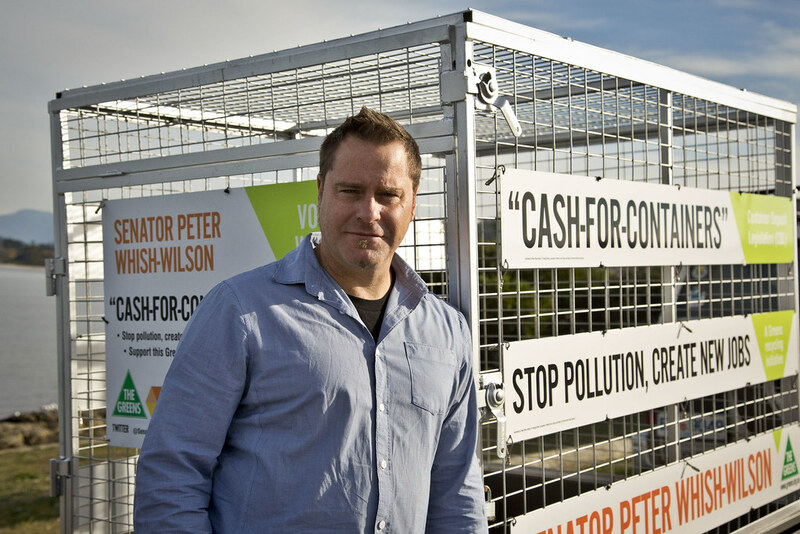 Peter Whish-Wilson, Australian Greens Senator for Tasmania and national spokesperson on waste and recycling, today launched his voluntary local cash-for-container scheme at Little Howrah Beach near Hobart. You can volunteer to help out with this scheme! "To prove just how effective these schemes are I'm going to run a series of clean ups around Tasmania, and donate 10 cents per can, plastic or glass bottle that community groups throw into my mobile recycling trailer," said Senator Whish-Wilson. "Cash for container schemes see recycling rates for beverage packaging of between 80-90 per cent around the world, compared to Tasmania's current rate around 14 per cent, the lowest in the country. "That's because much of this waste is consumed outside the home, and is not captured by curb side recycling schemes. "We need to ensure our trash never gets the chance to enter gutters, creeks, rivers and oceans, and jurisdictions with these schemes have been shown to have much lower levels of marine plastics, one of the most pervasive pollution issues affecting wildlife in our oceans. "A 2011 EMRS poll commissioned by The Boomerang Alliance showed that 91% of Tasmanians support the implementation of a Container Deposit Scheme (CDS) and cash-for-containers will create about 300 full-time and 80 part-time jobs in Tasmania (1) - it's a no brainer, really. "I call on MPs from all parties to back a national scheme as quickly as possible, and to make the choice to stand against the powerful corporations who are putting their profits before communities, local jobs, and the environment by blocking recycling in Australia," he concluded. (1) West, D. 2011. What Container Deposits Will Do for the Tasmanian Economy, The Boomerang Alliance.